Czech filmmaker Karel Zeman is largely unknown to modern western audiences, and that’s unfortunate. If it weren’t for my trusty Psychotronic Film Guide, Zeman would probably have remained unknown to me as well. Chances are, when we think of the film adaptations of Jules Verne’s stories, Disney’s superb version of 20,000 Leagues Under the Sea (1954),* and to a lesser extent, Mysterious Island (1961) and Journey to the Center of the Earth (1959) spring to mind. Zeman, working with a much smaller budget than his American and British contemporaries, managed to create eye-popping visuals that rivaled anything seen in those films. * For my money, this remains the gold standard for Jules Verne adaptations. The Fabulous World of Jules Verne (aka: Vynález zkázy, or The Deadly Invention), is commonly credited to the eponymous author’s novel Facing the Flag, but it would be more honest to view the film as Jules Verne’s greatest hits. You don’t have to look very hard to find equal measures of 20,000 Leagues Under the Sea, Mysterious Island, and Master of the World. Fabulous World relies on that most venerable of narrative tools, told in flashback from the journal of Simon Hart (Lubor Tokos), a professor’s assistant, who also narrates the tale. Hart, along with his mentor, Professor Roch (Arnost Navrátil) are kidnapped by pirates and taken to a secret island base belonging to Count Artigas. The brilliant but dense Roch goes to work developing a new power source for his abductor/benefactor, thinking he’s doing a service to mankind. But he’s nothing more than Artigas’ pawn, creating a devastating weapon that can destroy anything in its path. Story and dialogue take a back seat to spectacle, but viewers won’t likely notice the film’s deficits, with so many visual treats to behold. Zeman makes it clear that it’s the eye candy that should be front and center, not the actors. And what glorious eye candy it is. Using his black and white canvas, Zeman and crew created the look of turn-of-the-century engravings. Seeing the results on screen is to see a labor of love, meticulously hand crafted to simulate vintage book illustrations come to life. The filmmakers employed everything at their disposal,* combining live action performers with detailed miniatures, matte shots, puppetry, stop-motion animation and paper animation. The Fabulous World of Jules Verne stands apart from its western counterparts because it embraces the artificiality of the film medium. The scenes are packed with visual wonders at every turn, that never existed, but you wish they did. The Fabulous World of Jules Verne belongs within a continuum of more than a century of filmmaking, beginning with the work of George Melies, and continuing with the German expressionists of the teens and ‘20s. Zeman owes much to the old masters, but in turn, it’s not too difficult to spot how he influenced the filmmakers who followed in his footsteps. Whether it was unconscious or by design, Zeman inhabited the DNA of many others, such as the animations of Terry Gilliam (nearly three decades before Gilliam’s version, Zeman graced the world with his own version of Baron Munchausen). It’s not too much of a stretch to see Zeman’s film in Hayao Miyazaki’s (particularly Porco Rosso, Kiki’s Delivery Service and Howl’s Moving Castle) efforts, with regard to fantastic land, sea and air vehicles. The underwater scenes in Fabulous World also seem to be the spiritual ancestor of Henry Selick’s animated sequences in The Life Aquatic with Steve Zissou (2004). The integration of live action actors with an artificial environment serve as a template for many of the genre films that followed decades later, especially Steven Lisberger’s Tron (1982) and the CGI-rendered landscapes in Kerry Conran’s Sky Captain and the World of Tomorrow (2004). Zeman and his team deserve a rightful place alongside his western counterparts for changing the face of effects in films. 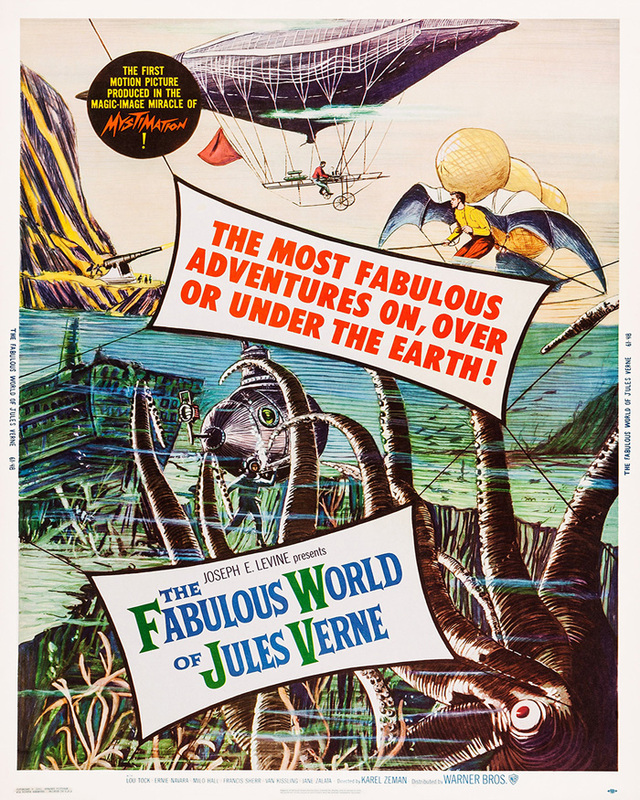 The Fabulous World of Jules Verne is a fitting counterpoint to Disney’s 20,000 Leagues Under the Sea, which sits on the opposite pole of the aesthetic spectrum. If the Disney film was the ideal realization of the Jules Verne universe made real, then The Fabulous World of Jules Verne is the perfect visualization of the abstract. While American films attempt to push special effects to the limit, simulating reality as much as possible, Zeman achieved the converse. The limitations of the effects in Zeman’s film are not a liability, but an asset, exploiting the surreal potential of cinema, making everything as unreal as possible. Sold! I will definitely have to catch this one -- it sounds fascinating! And who doesn't love Jules Verne, honestly? It's short on story, but it more than makes up for it with an abundance of whimsy. Highly recommended!